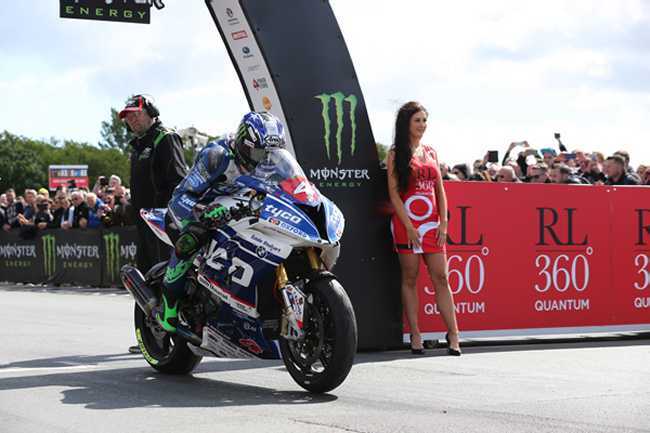 Ian Hutchinson made it three RL360 Quantum Superstock wins in a row, and his second victory of this year’s Isle of Man TT Races fuelled by Monster Energy, when he dominated Wednesday’s race. The win gave him his 16th TT wins in total. 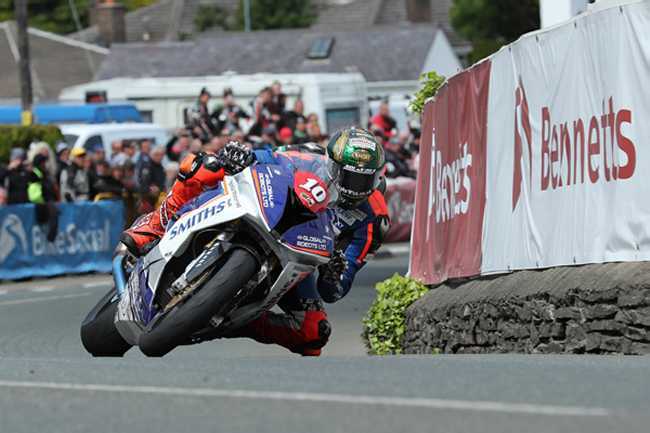 The Tyco BMW rider led from start to finish to take the win from Peter Hickman by 22.4s while there was joy for the Manx contingent with Dan Kneen taking his maiden TT podium in third. Riders were warned of cross winds at Crosby Hill and damp patches at Ginger Hall, Ramsey Hairpin and Hillberry ahead of the race. Michael Rutter led through Glen Helen on the opening lap by one second from Hutchinson with Hickman only three tenths of a second further back. There was disappointment though for James Hillier who was an early retirement at Ballacraine. By Ballaugh, Hutchinson had inched ahead and rounding Ramsey Hairpin for the first time, his advantage over Rutter was 1.3s. Hickman was still third a further 1.5s back as Kneen, Dean Harrison and Michael Dunlop rounded out the top six. As they flashed past the Grandstand for the first time, an opening lap of 131.109mph gave Hutchinson a 4.5s lead over new second placed rider Hickman with Rutter now in third, only 0.17s behind his fellow BMW rider, but ahead of Kneen, Harrison and Dunlop. The first four riders all lapped in excess of 130mph, Kneen setting a new personal best lap, but Bruce Anstey, Conor Cummins and Gary Johnson all retired at the pits. Through Glen Helen on lap two and the gap was down slightly to 4.1s as Hickman opened up a two-second margin over Rutter. Kneen was well in contention for the final podium spot being just 1.5s behind Rutter. Good rides were also coming from Jamie Coward in ninth and Shaun Anderson in tenth. At the head of the field, and leading on the roads, Hutchinson was piling on the coals and by Ramsey he’d stretched his lead to a slightly more comfortable 7.8s over Hickman. Kneen was now in third though having turned his deficit to a 3.3s advantage over Rutter. Harrison and Dunlop remained in fifth and sixth. Coming into the pit stop, Hutchinson had lapped at 130.673mph on his second lap and changed his rear wheel as well as making a slight change to his front suspension setting. His lead over Hickman was still only 6.7s with Kneen now 5.8s further back. Rutter had slipped to five seconds behind Kneen with Harrison and Dunlop still in fifth and sixth. Coward, the leading privateer, remained in ninth, with Horst Saiger in tenth. Despite the wheel change, Hutchinson’s lead had doubled as he went through Glen Helen on lap three, the gap now 13.6s. Hickman, in turn, was over ten seconds clear of Kneen but Rutter, in fourth, was coming under extreme pressure from Dunlop, the difference between the two just 0.2s. Indeed, he’d nosed ahead by the time they reached Ballaugh Bridge. Heading into the final lap, Hutchinson’s lead over Hickman was down slightly to 12.4s with Kneen holding onto a comfortable third but Rutter had gone back ahead of Dunlop by 3.5s. There was to be no final lap drama for Hutchinson though and with the fastest lap of the race on the final lap, 131.639mph, he swept to yet another TT win from Hickman by a commanding 22.4s with Kneen making it an all BMW rostrum in third. The battle for fourth went all the way but Rutter held on by 1.1s with Harrison overhauling Dunlop for fifth on the final run over the Mountain. 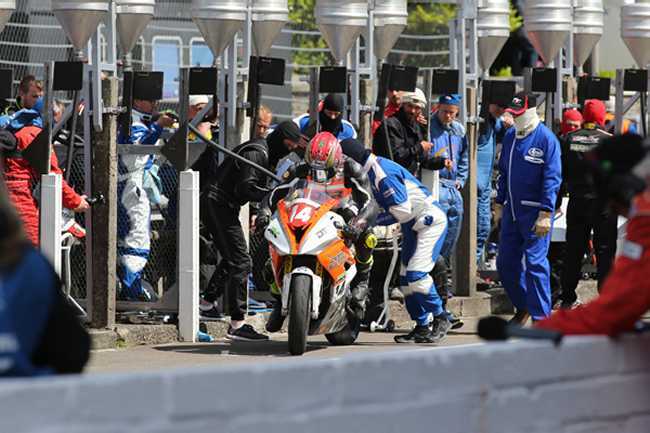 William Dunlop took seventh as David Johnson, Coward and Saiger completed the top ten. Hutchinson’s victory moved him to 61 points at the top of the Joey Dunlop Championship with Hickman still in second (56) and Michael Dunlop and Kneen up to joint third (35). Meanwhile, Coward’s ninth place saw him be the first privateer home but Saiger’s tenth place has seen him extend his lead in the TT Privateer’s Championship. He has 58 points with Sam West (43) in second and Coward (38) third.